Jonathan Joestar, or in short Jojo, is a young man strive to be the perfect English gentleman. His everyday life have been a complete paradise, until his father was asked to adopted a young man from his life savior, with taking the name Dio Brando. 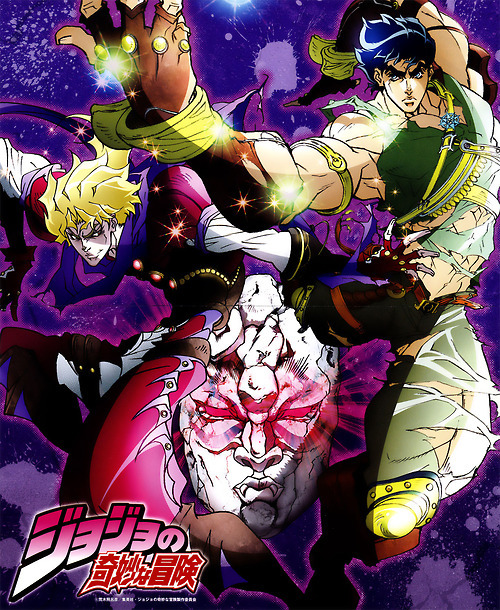 Now, Jojo must struggle with his life as Dio tried to take away everything he has, including the right of the fortune, with his cunning scheme and superior skill. Jojo’s Bizarre Adventure is taking place in London England, where manner and the concept of gentleman are thickly rooted. The direction of the story is completely the same as the Manga, but the Anime is far more superior in terms of conveying the malice environment. Of course, the drawing is also splendid rather than the Manga. You might notice all the main characters are very manly, with rough penmanship and thick eyebrows. My first impression of them would be “sturdy”. 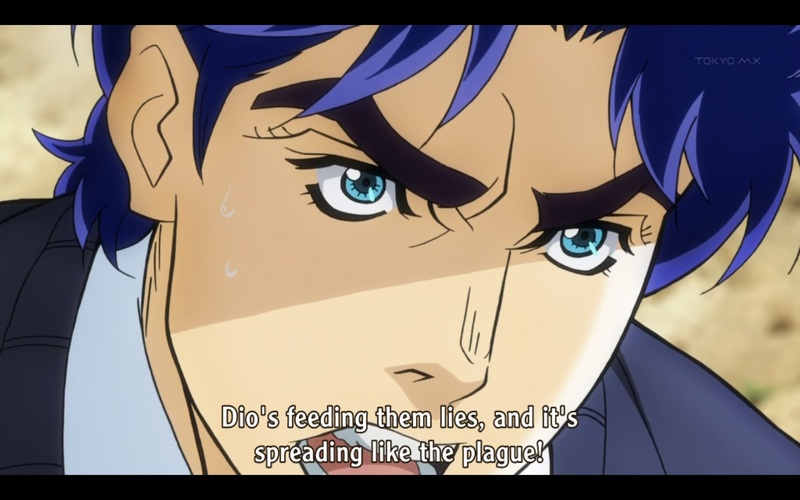 Jonathan Joestar spent his life with the prosperity environment, this explain his childlike manner and naïve way of thinking. With his kind and straightforward persona, he will leap to almost any circumstances that against his perception. Unlike Jojo, Dio Brando has a rough life by living in a slum. He went through his life and making money by winning a bet and tricking others. These develop a twisted, cunning, and conceit persona inside Dio. He is the type of person who tries gaining the sole advantage by eliminating his contestant, a person who wishes to become number 1 in all aspect. If that was taken from him, he will show you an unexpected development. 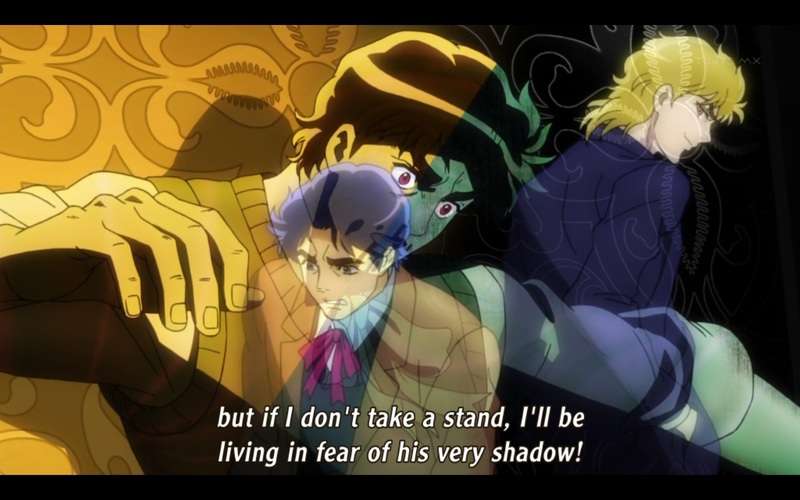 This 1st episode revolves around Dio, where he gives menacing environment toward Jojo. That environment also strengthens the sinister and malice aura produced by the BGM. The BGM is not overlapping the environment, yet almost guide us slowly toward the “pump” feeling. I also love the sound effect of “Dom”, it give the impact of surprised. Not to mention the flying word that seems to follow every surprising environment. If you want to see an Anime where cruelty is the main component, I suggest you try watching this. I’m rather confused with the title of Bizarre; it gives the impression that the author demeans his work rather than giving the clear picture of the story. You might also notice the way Hirohiko Araki drawing is similar to Buronson from the”Fist of the North Star”. 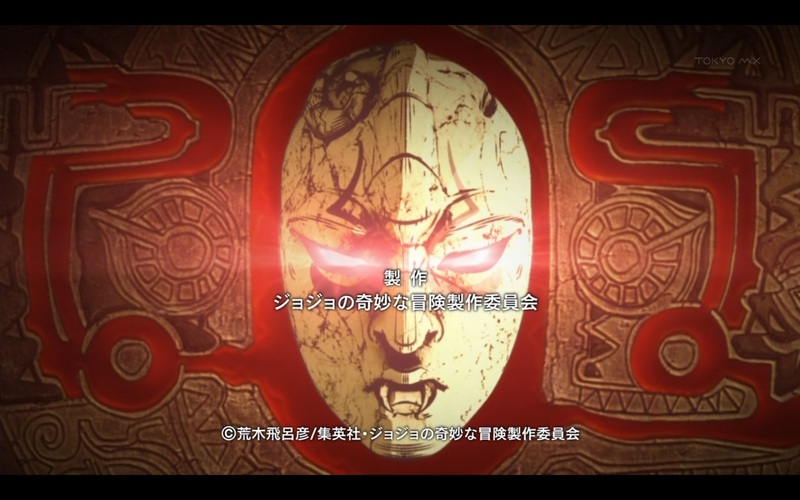 But I’m impressed with Hirohiko to be able to use the concept of good and evil toward this extent. 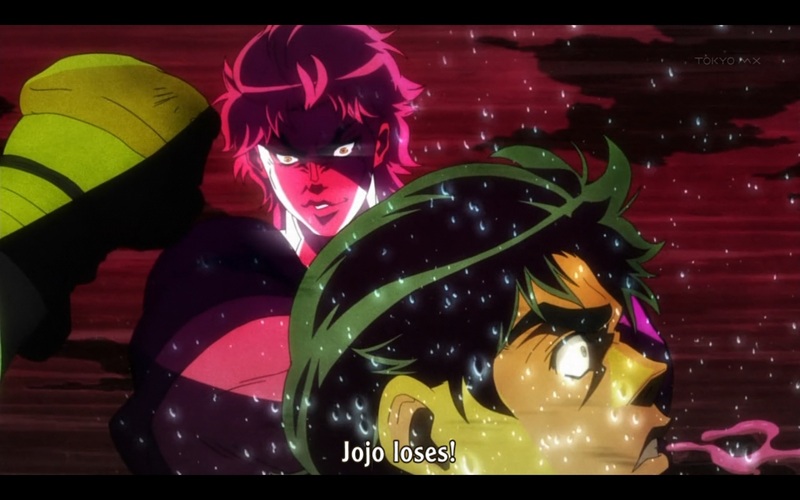 And David Production also able to make us hate the character Dio, thus when he was defeat we have a content feeling. Im sure if you watch this, you will be enchant to say “please just die Dio!”.